Airfix's 1/72 scale BAe Nimrod is a large and impressive kit. To their credit, Airfix has provided separate weapons bay doors and a basic ordnance bay area. Alley Cat has addressed the sparse detail of the Airfix kit's Weapons Bay with a resin replacement. 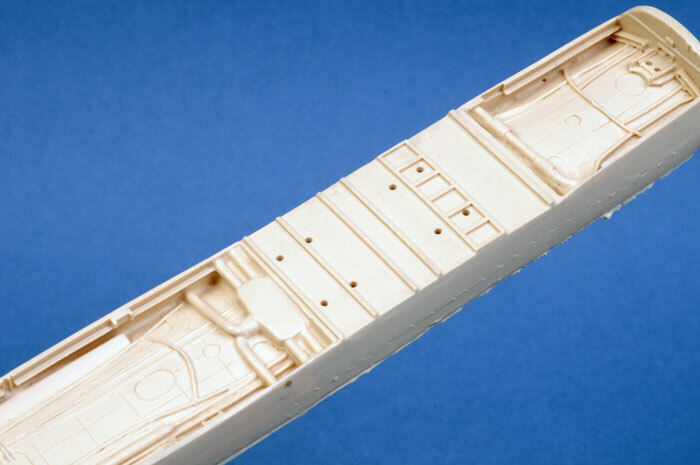 This comprises 13 parts in light caramel coloured resin - front, mid and rear bulkheads, the main bay and nine hangar rails. The large main bay is very nicely detailed with a combination of raised and recessed structural features, plumbing and electrical wiring all cast in place. This large casting comes almost ready to use. The remaining parts should be simple to remove from their casting blocks and clean-up prior to installation. Very little work is required preparing the kit for these resin parts. Just six small raised ribs must be sliced off the inside of the kit fuselage to permit the resin replacement to fit. The location of the hanger rails are clearly indicated in the main bay, and the front bulkhead attaches via a wide locating tab. 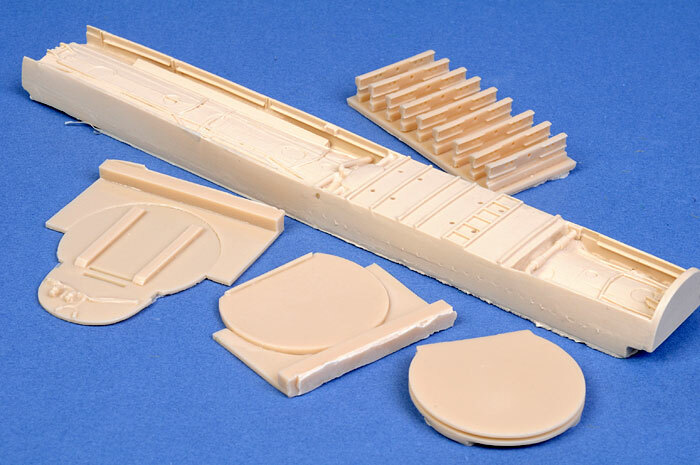 Alley Cat's 1/72 scale Nimrod Weapons Bay will represent a big improvement over the kit parts in a large and prominent area of the Airfix model.